Your Overseas Wedding has officially become an “Aussie Specialist” in 2011. Our knowledge in Australia is won the recognition from Tourism Australia. Under the support of Australia Tourism, Your Overseas Wedding actively promotes Australia overseas wedding and pre-wedding photo shooting, so as to provide nuptial couples a memorable and sweet travel experience. What is "Aussie Specialist Program"? Aussie Specialists are a dedicated group of retail travel agents actively selling and promoting Australia around the world. The Aussie Specialist Program (ASP) is Tourism Australia’s global online training program, run with the cooperation of the State and Territory tourism organisations. Tourism Australia has invested AUD400,000 to design the Aussie Specialist Program (ASP) courses since 2002. This program is specifically designed for the travel industry in order to provide travel agents and distributors with the knowledge and skills to promote the distinctiveness’s of Australia more effectively. The travel agents are trained through learning all aspects of Australia which include geography style, seasonal changes, climatic characteristics, characteristics of tourist attractions and travel arrangements. Your Overseas Wedding looks forward to providing consumers with more professional wedding service with this Aussie Specialist Program (ASP). What can nuptial couples benefits from ASP? Many nuptial couples choose to have their overseas wedding or pre-wedding photo shooting in Australia. They are usually facing the problem of accommodation, transportation and itinerary arrangement. However, it is difficult to choose a wedding company that is familiar with Australia in all aspect. ASP (Aussie Specialist Program) can assist nuptial to select the most confident assurance merchant in a various choices of wedding merchants in the market. As an Aussie Specialist, Your Overseas Wedding is the best wedding consultant to help nuptial couples to plan their perfect itinerary. Our insider knowledge of Australia means that we are well equipped to advise customers on all aspects of their holiday, from choosing the ideal experience to suggesting unique accommodation options. Your Overseas Wedding would provide couples an extraordinary, memorable and romantic Australia travel experience. Your Overseas Wedding in conjunction with Tourism Australia launch a series of promotion and publicity to introduce Australia's accommodation, transportation, culture and tourist attractions which are all about couples' concerns. Your Overseas Wedding is committed to providing each single couple a unique style and the most beautiful pre-wedding photos as well as a memorable and touching wedding. With professional knowledge and advice for the travel arrangement, Your Overseas Wedding ensures that nuptials can have comfortable journey and delicious food that letting them have the wedding ceremonies and pre-wedding photo shooting in the their perfect condition. They can also capture all the sweetest and precious moment while having fun. We promoted and introduced Australia wedding photo shooting and Australia photo shooting details on different wedding and tourist magazines. 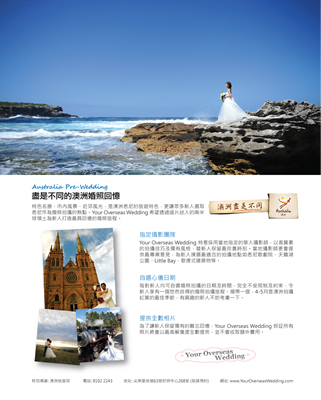 We even introduced the key features of photo shooting and wedding in Australia, letting more nuptial couples know more about Australia. In 2011, Your Overseas Wedding was invited by Tourism Australia to participate an industry exchange tour in Nanjing, China. The program allows Your Overseas Wedding to communicate and share experience with some other professional and experienced practitioners in the industry, in addition to have an in-depth understanding in marriage business of different cultural regions and tourism itinerary arrangement details. During the event, Your Overseas Wedding has shared ideas with the professionals in Greater China region. Besides, we have discussions on different aspects with regional tourism organisations from Australia such as Gold Coast Tourism Corporation, Tourism New South Wales, Tourism Queensland, Tourism Tasmania, Tourism Western Australia, Tourism Southern Australia, Blue Mountains Tourism, Tourism of Victoria, etc. With this experience, Your Overseas Wedding is confident to provide couples an excellent travel arrangement for hotels, transportation, entertainment, meals and etc when they plan their wedding or pre-wedding photo shooting in Australia. Your Overseas Wedding keen on providing nuptial couples a wonderful, unique and unforgettable love journey in Australia.